Your senses can be tricked! There is no wrong or right answer in wine tasting, there are errors however that could bias your perceptions and therefore your overall evaluation and appreciation. We distinguish two types of errors: the physiological ones due to your sensory system and the psychological ones due to your cognitive abilities. These are usually out of your control as a taster. If you fell into one of this "sensory illusions", it is likely that you will not notice it, you will proceed as usually, and this is the scary part! These are caused by the way your senses work, how they drive the sensation caused by the odor or taste to your brain and its analysis capabilities. It is difficult to illustrate a "sensory illusion" related to the chemical senses. Visual illusions, I am sure, you have been exposed to. Here are two examples of errors demonstrating how your senses treat the sensory information and may mislead your judgment. 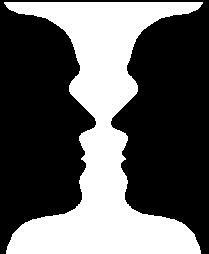 On the left figure, one can see a vase or two faces. On the right figure, one can see a young or old woman. Sensory adaptation is a physiological phenomenon that can alter your wine perceptions. It consists of a repeated stimulation of your senses by the same stimulus (an odor or a taste), which will cause a decreased sensitivity in your perceptions. The tasting leader introduces the tasting by: “Today, you are going to taste Sauvignon blanc wines from New Zealand”. If you have studied wine appreciation or sommellerie, or if you are an avid reader of wine reviews, you may know that Sauvignon blanc wines have typical grapefruit and tropical fruit aromas, and the New Zealander wines are made to express grassy and asparagus aromas. Therefore you have some expectations. Consequence: the overly anxious taster will perceive sensations that may not exist; the over confident taster may overlook real perceptions because they are out of his her sensory radar. Result: your tasting experience and notes will be biased! How to counter bias due to expectation? Do not try to know in advance what the tasting in on or is for. The less you know, the more objective you are as a taster. Good practice: have your tasting samples presented blind. No information whatsoever. Glasses are coded with 2 or 3-digit codes randomly chosen. When more than one characteristic is evaluated by the wine taster, the rating of one characteristic (e.g. aroma intensity) may influence the rating of another characteristic (e.g. flavor intensity). The halo effect is unfortunately occurring too often in wine appreciation practices. Tasters will analyze their wine perceptions and then rate their overall liking or the overall quality of the wine (the last two concepts are highly correlated; the higher the perceived quality, the more you like the wine). To counter the halo effect: I recommend evaluating each sensory modality (i.e. smell, flavor, mouthfeel, and appearance) independently. What does it mean in an ideal world? to taste the same wine in different flights and with different codes to assess different sensory modalities. That means a lot of glasses...but that’s why you have a dishwasher nearby. This will happen if a stimulus -irrelevant to the wine analyzed- is taken into account in the wine evaluation. For example, these stimuli can be different glass shapes , or different layouts for the wine glass arrangement in front of the tasters, different label shapes or colors used to code the wine glasses. 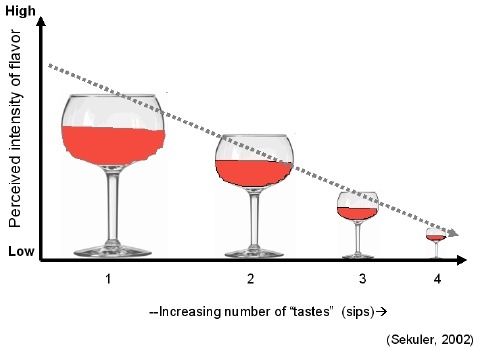 This error happens when two or more sensory perceptions are associated in the mind of the wine tasters. Example: You smell a white wine, but looking at its color, slightly orange, you start to perceive oxidized apple. Darker colors (orange, brown) in white wines tend to signal oxidation, a defect due to the wine exposition in its making or storage to too much oxygen (air) and leading to chemical reactions affecting the wine color, aroma, and likely taste. So in this case, the color biased the aroma perception because the orange color maybe due to natural aging or other causes that should not lead to an oxidized aroma! Contrast effect: In a flight of six wine samples, the tasting leader has included a very old wine along with 5 wines from the past vintage. Tasting the old wine after a series of young wine will create such a contrast that the rating of the former maybe overestimated or underestimated. In a flight, it is better to have a large variation of wine styles or ages (for example 3 old and 3 young wine samples, presented in a random order) to minimize this effect. Group effect: the tasting includes four flights of Chardonnay: the first flight represents wine from bag-in-box. The second, Grand crus from Burgundy. The tasting leader has chosen to present the series of bag in a box wine along with a Grand cru. This poor grouping will lead to a lower rating of the Grand Cru than if it were tasted on its own. Error of central tendency: “here are 3 wine samples, which one do you prefer?” if the wines are not distinguishable, more than 33% of the tasters will choose the middle sample, which is more than chance and may lead to the conclusion that the middle sample is the preferred wine. This is the central tendency effect, we tend to choose the middle sample when we are forced to choose one out of three. Try with your kids or friends (it always work!). To minimize the central tendency, randomize the presentation order among the wine tasters. More work, yes, but less biases and false conclusions. Position effect: if asked to rate our overall liking of a series of wine, the first sample will likely have the highest rating overall. So if we give the same order to every taster, we will likely bias the conclusions and state wrongly that the first sample were preferred. When we rum consumer tests, we give a dummy sample as the first sample to every one, knowing that this sample will be overly rated. We discard the dummy sample data to focus on the wines of interest. The response of one taster can be influenced by the opinion of other tasters, especially if the other people are more experienced or higher in the company hierarchy. This is why we recommend to let the tasters evaluate the wines independently, to take their own notes and to discuss afterwards with the group. Even if mutual suggestion happens in the group discussion, the individual tasting notes are the ones to consider if it is a professional tasting where data are critical. It is the tendency to give higher ratings to products you know or to please the tasting leader. This error can happen a lot in professional tastings and especially tasting happening within one company tasting its competitors. Tasters will be more lenient towards the company wines and will tend to give lower ratings to the other products. This error can be confounded with sensory adaptation, although it is based on human tendency to rely on habits. In tasting, this error leads tasters to give similar intensity ratings for a series of wine sensations that slowly increase or decrease. The stimulation is monotonous, this affects the taster’s attention and he or she gives the same score and may miss a different perception, just by (bad) habit. This will rarely happen in social wine tastings where the wine palette of sensations is varied. However, as a wine professional, you may encounter this type of error. For example, you assess wines produced in the same region and the same year according to very similar winemaking practices. The differences between the wines may be subtle and you may rate the “typicality of the varietal character” similarly due to the set of wines. To counter habituation: have some unusual samples in the flights of wines to awaken tasters’ senses and break the habituation risk. All these tasting errors are made by the tasters unconsciously. As a taster, you are not aware that these errors affect your tasting conclusions. You are an honest and objective taster. Even if you try hard not to be affected, you will... and this is true for everyone including the experts. I personally reckon to like better (and rate better) Sparkling wines coming from one of my favorite areas, when I can see the label (expectation error). When I taste blind, without knowing and seeing cues, I have no expectations! Sensory Adaptation is a tasting error that can be easily controlled by following some tasting tips.